With each stroke of the brush they change their positions as they try to run away. The movements become increasingly dynamic, the music becomes more dramatic, one can no longer distinguish as to who is leading and who is following. The painter dances with the shadows of his Muses, trying to catch them, embrace them and then let them go, just so that he is able to chase them again... waiting for the inspiration to return.... when this happens he is able to see the Muses and their dance in front of the canvas..
Now he can even touch them. Once they reveal their form, the painter is able to return to the canvas and finish his painting with certain moves and a clear vision. Then the music stops and the dance of the Muses ends. 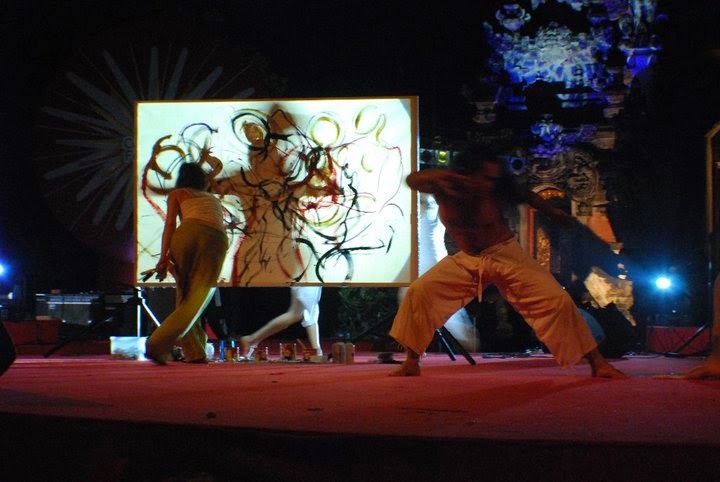 The idea for this performance arose from the concept of the Indonesian traditional shadow theater "Wayan kulit" and Plato's theory of ideals and their shadows projected into the world as we know. According to him the artist is trying to catch the shadows and transform them so that they would come as close as possible to the ideal they present.Through this he is actually creating a new world, a world of his imagination or, to put it in other words, a world of the shadows' shadows.. The story behind the performance is a story of any artist, no matter from where he comes from and regardless of the artistic means of expression he decides to use. Therefore this show is open for interpretation and collaboration with artists, regardless of the art media they might use. Some years ago I saw a shadow puppet play in which the dancers replaced the puppets and this resulted in the traditional decorative effect being replaced with a very expressive appearance. Besides the traditional Gammelan orchestra that accompanies the show as it would in a traditional shadow puppet theater, the show stayed in my memory as a successful attempt to join contemporary art with traditional, and this later on became the base for the Jazz multimedia project with Koko Harsoe. I meet Koko while I was working on an art project based on cultural differences and their reflection on contemporary art that took place on Bali. 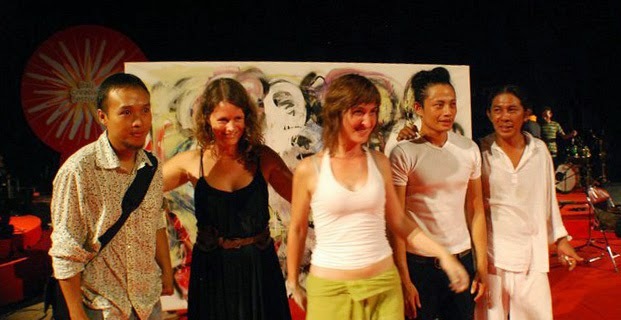 Our friendship lead to a productive period that allowed me to enter the world of music that I could feel and understand, translating it into the language of painting. 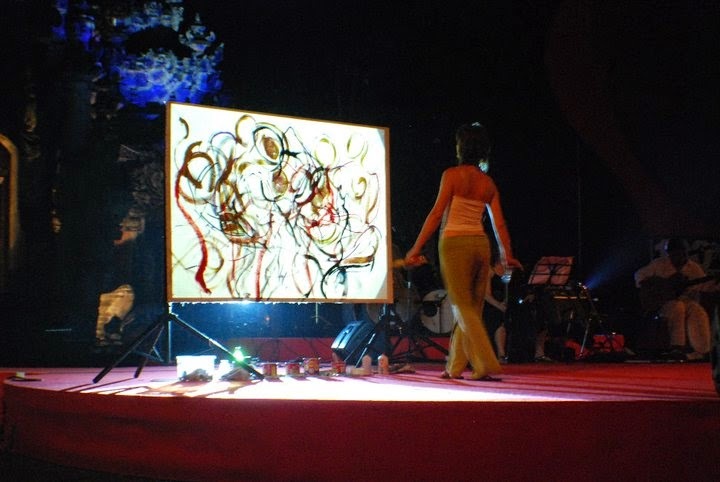 I was absorbing the world of Jazz music, transforming it into images on canvas. Sometimes when my friends played music, they looked like children playing a game, teasing each other, adding a point, creating a dialog and it sounded like they were having great fun. I wished I knew how to play an instrument so I could join them in their game. I always admired the ability of musicians to communicate with others through their play, often even without knowing each other, and yet they are able to make music together. I do not have in mind improvisation, for that is not something strange to me, but about the ability to adapt to an interference upon which one doesn't have control and responding to it in a constructive way that should lead to an art piece created by several minds. This is something unusual for visual arts and could well be the main difference between music and painting or dancing and painting. The painter is normally involved in a deep intimate relationship with his canvas and there is no outside interference that would affect his art. Thus I asked myself the question to which I did not expected an answer "How could a painter jam?" 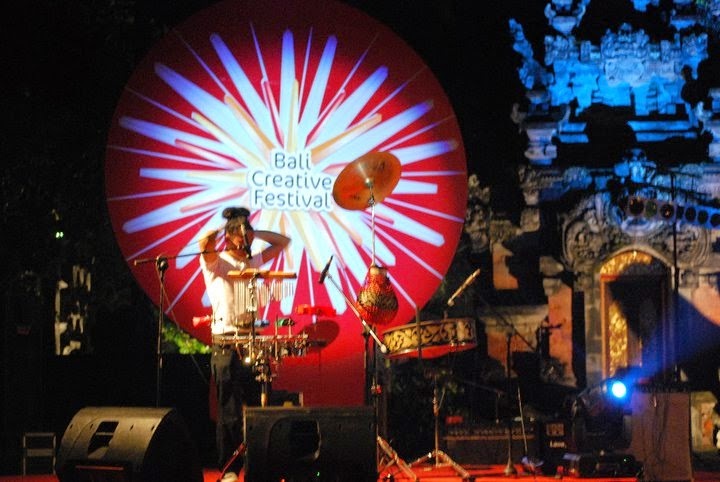 The answer came when Koko came up with the idea that I should join his bend at the Bali creative festival. We knew each other for a while and even though we work in different media we share a similar interest and views on art, in other words we have a "good connection". The question was not if we should do something together, but how to join such different media and still keep the piece organic. So, we decided to start with something all artist share, regardless of their means of expression, and that is inspiration. The process of creating art, the transition from the idea to its materialization to the finalization of the art piece. 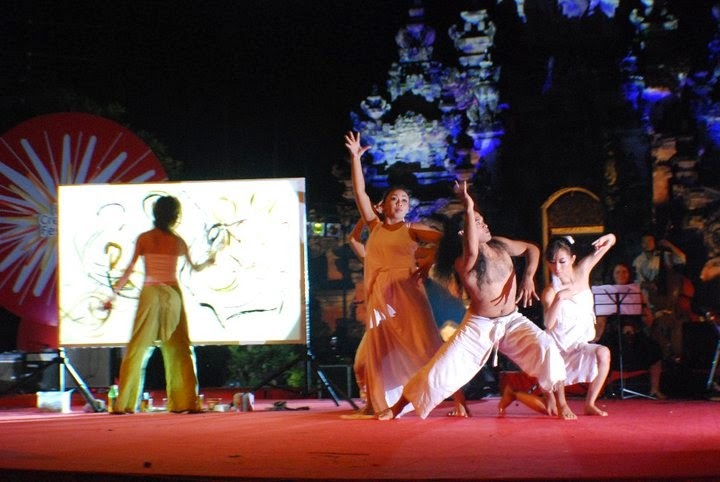 Thus we adjusted the concept of the shadow puppet theater to the Jazz multimedia project with Koko's music, my painting and the fantastic Sefi Indah P.mouvmens and her dancers. We met just once before the performance so that we would agree to some general coordination, so that we had an approximate idea as to who is doing what and when. Of course this did not go this way at the actual performance. 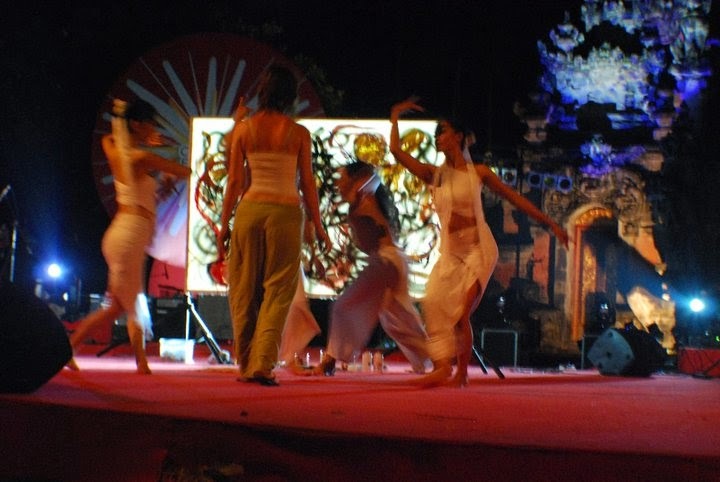 Many things and details were changed during the performance. There was a great deal of surprises and improvisation that made the entire thing even livelier. My canvas simultaneously represented a painting and a screen for shadows, moving to the rhythm of the music that I was chasing like I would chase an inspiration or a vision. The result was a fusion of different media that interacted and responded to each other and yes, we had fun! It was great working with such good artists and finally, I discovered a way to jam! Simbioza treh različnih umetniških medijev (glasba, ples in slikanje), ki razkriva skrivnosti umetniškega prepleta, sporoča zgodbo kreativnega procesa, kjer vsako umetniško delo postane to kar je, z vsemi notranjimi boji in patosom umetnika, ki sledi svoji lastni viziji. Gre za zgodbo o inspiraciji, ki jo reprezentirajo plesalci kateri se pojavljajo v preformansom kot muze. Skozi glasbo muze počasi vstopajo na oder, kot da se zbujajo in pripravjajo na življenje. Na odru je postavljeno slikarsko platno dovolj veliko da odigra funkcijo ekrana za senčni teater. Iza platna je reflektor ki bo projeciral sence plesalcev na ekran - slikarskega platna. Nekateri plesalci se gibljejo za platnom in s tem ustvarjajo sence slikarju, ki skuša s čopičem zajeti njihovo gibanje na platno. Z vsako potezo čopiča spremenijo položaj medtem, ko skušajo pobegniti da bi se spet vrnili in pustili, da jih umetnik ulovi. Končno se prikažejo slikarju ga obkrožijo in se pustijo da se jih lahko celo dotakne. Ko se plesalci razkrijejo, se slikar lahko vrne h platnu in zdaj z jasno vizijo lahko dokonča sliko. Po končani glasbi, se ples muz konča, luči se prižgejo in publika vidi rezultat procesa ustvarjanja oziroma končano sliko. Ideja za ta performans izhaja iz koncepta Indonezijskega tradicionalnega gledališča senc ''Wayan kuilt'' in Platonove teorije o idealih. Sence so projecirane v svet, ki ga poznamo. Umetnik poskuša ujeti sence in jih s tem transformirati v idealno podobo njihove prezence. S tem kreira nov svet, imaginarni svet oziroma senčni svet senc. Zgodba, ki se skriva za nastopom ( performansom ), je zgodba vsakega umetnika, ne glede na to od kod prihaja in kakšen je njegov način izražanja. Tako je ta predstava odprta za interpretacijo in sodelovanje med umetniki, ne glede na umetniški medij, ki ga uporabljajo.